Differences Between Idealscope, ASET and Hearts&Arrows Images? It’s getting a bit serious. We’re going deep into diamond light performance tools. Lucky enough, we don’t need to tackle the calculus, and easily see, through colors, how diamonds return light to our naked eye! The Idealscope, ASET, and Hearts & Arrows Images seem very much alike for first-time viewers that stepping into this process of deeper analysis is kind of daunting. I know I would always advocate looking into the grading report and seeing the diamond with real-life imagery, and of course, with your bare eyes. But the reality is, more and more consumers are learning a superior way to discern diamond performance. And if you’re reading this right now, you’re most likely one of them. Now, as long as you’re not heading to paralysis over analysis, and you’re having fun doing so, such images will only arm you with greater knowledge! Whether it reflects a lot of light back to the viewer or a lot of light just leaks through the diamond, this is the deciding factor in the brilliance, fire, and scintillation of a diamond. And in fact, it is what the beauty of a diamond hinges upon. The concrete way the light gets reflected is dependent on the diamond cut and this is also why this is the most important factor in the beauty of a diamond! Now, just looking at the diamond proportions and symmetry of a diamond is not enough to make an in-depth analysis on light performance. It’s easy to see why such a diamond will not have an excellent light performance. However, in two diamonds with the best diamond cut, the one with better symmetry will perform better. This is where the role of Idealscope, ASET, and Hearts and Arrows Images take play. The first two can help you evaluate the light performance of a diamond. Hearts images viewed through a hearts-and-arrows viewer, on the other hand, will help you evaluate symmetry. They are often provided for hearts and arrows diamonds which are well known for being super symmetrical. The Idealscope is an invention by Gary Holloway who is a legend in the diamond industry. He is also the inventor of the Holloway Cut Advisor – a very useful tool in weeding out low-performing diamonds based on their proportions. Read my article on the drawbacks of the Holloway Cut Advisor to get a round view. The Idealscope is a hand-held version of the Firescope that was invented in the 1980s by Mr. Kazumi Okuda in Japan. While the ASET Scope was invented in 2005 by AGS (American Gem Society) which is among the two most reputable grading labs in the world. AGS even uses ASET results to determine the cut grade of a diamond. Nowadays, both Idealscope and ASET images are extensively used to evaluate the light performance of a diamond, and in fact, online vendors like James Allen, Brian Gavin, and Whiteflash readily provide this information. 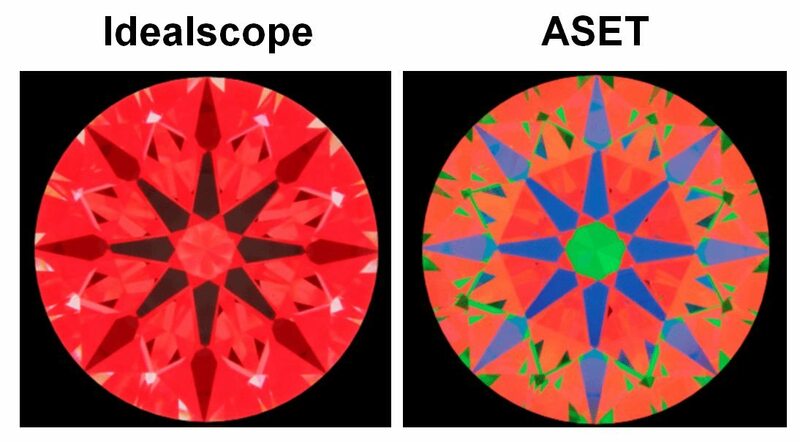 The main difference between an Idealscope image and an ASET image is that the ASET Scope uses several colors to represent areas of light leakage and light entrance. For beginners, ASET images might, therefore, be easier to interpret. Looking at an Idealscope viewer, you can see that it has a black lens and a red belt. ASET, on the other hand, has a blue, a red, and a green belt. Both tools expose areas of white (or black if it’s not backlit) light leakage, but the ASET image reveals more information. The ASET can also show the intensity of light that is returned to the eye thanks to the lower green belt. For most consumers, however, it will not be so much of an issue of how to make your own Idealscope or ASET image. Every good brick and mortar and online diamond store should be able to provide these images when asked. Idealscope and ASET images are also very helpful in picking a true hearts and arrow diamond with superb fire, brilliance, and sparkle. Now, you shouldn’t confuse Idealscope or ASET with hearts images. The latter comes into being when you make a picture of a diamond through a hearts and arrows viewer. For hearts and arrows viewers, there are also hand-held devices and desktop devices that work together with the computer. Corporations and grading labs will rather use desktop solutions that are high-tech and can simultaneously calculate proportions. However, a hand-held hearts and arrows viewer will be more than enough to give you lots of information about the symmetry of a diamond. A hearts and arrows viewer can depict hearts and arrows in a diamond but only in a diamond that actually is a hearts and arrows. Only around 1% of all round cut diamonds worldwide are actually real hearts and arrows diamonds. In my article about hearts and arrows diamonds, I have taken a look at the question of whether hearts and arrows diamonds are actually worth buying. Whether you see hearts or arrows will depend on how you put the diamond into the hearts and arrows viewer. In my later tutorial, I will show you exactly how to evaluate a hearts and arrows image and how to differentiate between true H&A diamonds and near H&A diamonds. 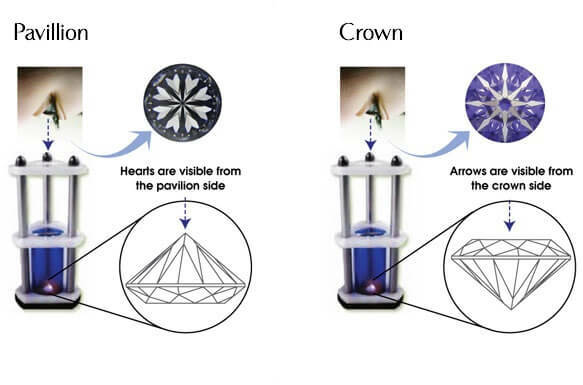 Now, it is entirely sufficient to only look at the hearts image of a diamond to determine whether it is a true hearts and arrows diamond. If the hearts are perfect, the arrows will be perfect, too. That is why diamond experts usually only look at the hearts images to evaluate the symmetry of a diamond. Thus, you need not worry so much about the arrows image. The one thing they all have in common is you can see the Hearts & Arrows pattern in the diamond clearly when using these tools. The H&A viewer easily lets us know of the diamond’s cut grade. But an excellent symmetry doesn’t guarantee superb sparkle, so it’s not a reliable option. Idealscope, however, showcases light return with its red colors and light leakage with white. I would recommend it for round cuts, but do avoid it when it comes to fancy shapes as it wouldn’t reveal other intensities of light. It will simply be red not disclosing the angle of light origin. The more accurate one is ASET. With its green color, we are able to see less intense light return in specific angles of the diamond. 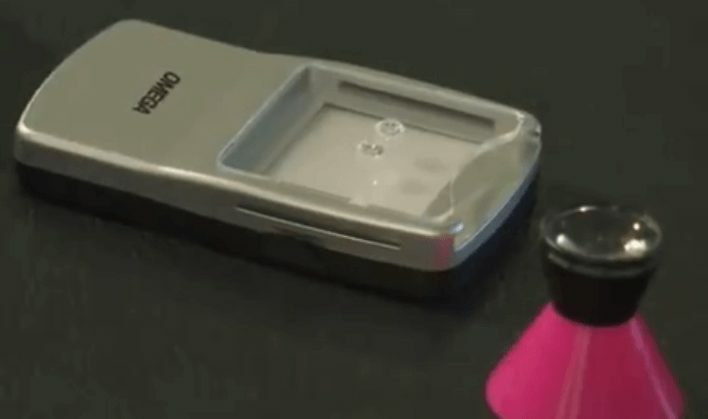 You can trust that it will work perfectly for both round and fancy cuts. It actually depends! The hearts and arrows is initially excluded from the choices as its main purpose is only to help us see the ideal h&a symmetry. When it comes to light performance, ASET, as proven earlier, offers more information. Although, you would have to look into the colors’ meaning further. And this brings out the simplicity of the Idealscope that directly reveal the amount of light and contrast. You don’t need rocket science to learn how to use these tools. Let’s just put it this way: if you’re shopping on your own, the Idealscope image tells you point-blank what you need to know regarding diamond optics. If you need a more detailed knowledge on your expensive purchase, there’s ASET. 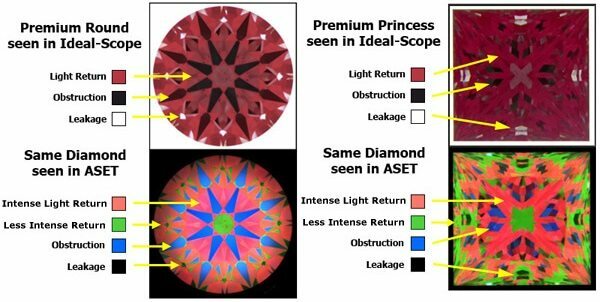 In a nutshell, the Heart and Arrows viewer, Idealscope, and ASET will only show your diamond’s light leakage/return, contrast, and symmetry. Its fire and scintillation will depend on precise cut proportions. So, while they are great tools, they are not the end-all-be-all sparkle parameter. Cut, as always, is king! Now, the way you should go about choosing your diamond is to narrow down your search to the best three options that you could find! All these options should be within the perfect diamond proportions for round cut diamonds. Then, in order to make the best decision, you should look at the Idealscope and ASET images of each diamond. For diamonds advertised as hearts and arrows diamonds, it is also vital to check the hearts image to make out which diamond has the better symmetry. Making these kinds of decisions can be tough sometimes and so you will have to know exactly what to pay attention to in every image. Let's begin with the Idealscope image evaluation on the next page! Should you have any question, please feel free to write to me. Or comment down below!